A fireline is established to secure the perimeter. FINAL FIRE UPDATE 6/5/16 9:00 PM – The 588 Fire was managed for multiple objectives, which resulted in the reduction of hazardous fuels accumulations, wildlife habitat improvement, overall forest health and rangeland improvement. Firefighters spent today securing the perimeter of the 588 Fire and containing the fire at 800 acres. There will be no further fire growth (spread) beyond what was achieved on June 3 (800 acres). They mopped-up any hotspots that remained in the interior. Due to elevated humidity and pulses of moisture (past, present and future), the fuel moisture levels have risen and this current condition is not the optimum condition for burning, therefore it will not be able to meet any additional management objectives for resource benefits. This decision-making process demonstrates that there is a high level of assessment that occurs during this type of incident (management strategy). Knowing when to transition to the next phase (containment) requires an extensive level of engagement and coordination as conditions continually change. Forest Service hotshot crew (Smokey Bear Hotshots) will demobilize from the fire tonight, however three Forest Service engines will remain assigned to the fire to monitor and patrol the area for the next several days. A total of 17 personnel will be assigned to the fire. THIS WILL BE THE FINAL FIRE UPDATE FOR THE 588 FIRE, unless there is a significant change to report. FIRE UPDATE 6/4/16 9:00 PM – The 588 Fire continues to be managed for multiple objectives, which will result in the reduction of hazardous fuels accumulations, wildlife habitat improvement, overall forest health and rangeland improvement. Today (6/4/16) increased humidity and cloud cover moderated fire spread resulting in no additional growth. The current fire size is holding at 800 acres. Portions of the pre-designated perimeter lines have been secured, which represents 25% containment of the targeted area of 2500 acres. As weather conditions continue to fluctuate from humid, cloudy days to hot, dry days during the month of June, the fire has the potential to spread. Reinforcement of perimeter lines will continue as the fire spreads well within the pre-designated boundaries (please refer to attached map). 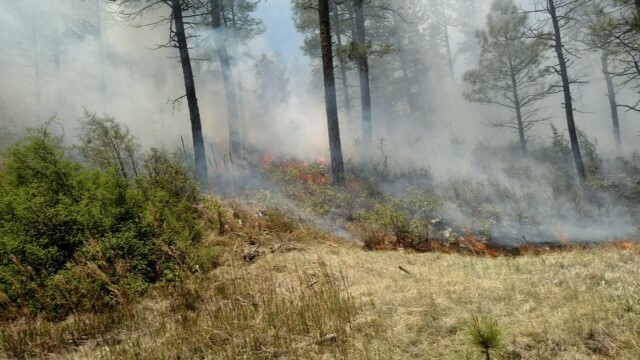 Favorable weather conditions can encourage fire behavior to increase and personnel remain assigned to monitor, check and direct the spread of the fire so that it stays within the designated boundary. The staff of the Smokey Bear Ranger District is very appreciative of the support they are receiving from Ruidoso and the surrounding communities–for their hard work and efforts towards managing this fire for resource benefits. FIRE UPDATE 6/3/16 9:00 PM – The 588 Fire is being managed for multiple objectives, which will result in the reduction of hazardous fuels accumulations, wildlife habitat improvement, overall forest health and rangeland improvement. Today (6/3/16) a combination of factors led to fire growth. The warmer, drier weather, in combination with fire operations to secure and check the fire’s spread contributed to the movement of the fire. As the fire moved across the landscape, smoke was visible. All fire operations went well today and public and firefighter safety remain the top priority on all wildfire incidents. The fire is burning in such a manner that it is meeting the objectives to improve overall forest health. There is still potential for additional growth over the next few days or possibly 2 – 4 weeks. The maximum size of the area in which this fire can be managed for multiple objectives is 2500 acres. FIRE UPDATE 6/2/16 9:00 PM – The 588 Fire is being managed for multiple objectives, which will result in the reduction of hazardous fuels accumulations, wildlife habitat improvement, overall forest health and rangeland improvement. FIRE UPDATE 6/2/16 11:30 AM – No new information to report at this time, the next fire update on the 588 Fire will be posted this evening around 8:00 pm. Assigned Resources: Forest Service hotshot crew will be release tonight (June 5), 3 Forest Service engines and overhead – approximately 17 personnel will remain assigned to the 588 Fire to monitor and patrol the area over the next several days. 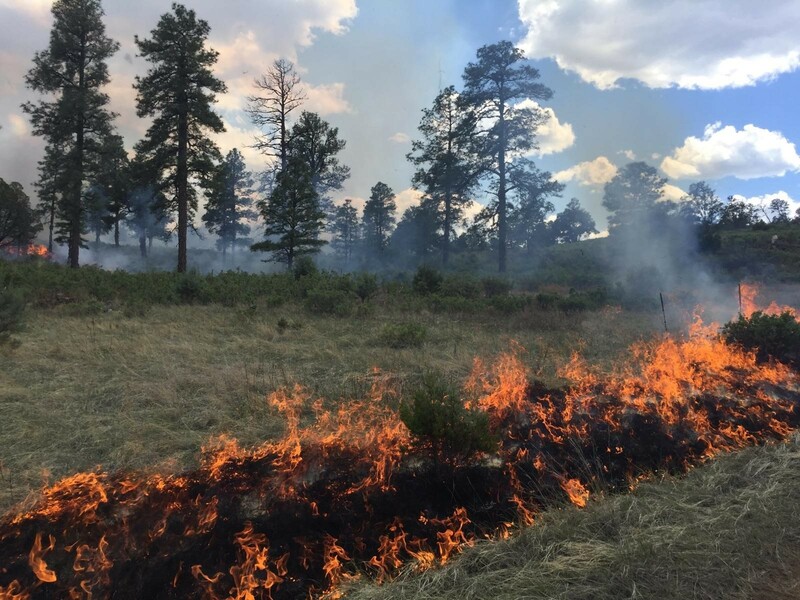 Initial Status: The fire is primarily burning along the grass understory beneath pinon juniper and ponderosa pine trees, at an elevation of 6,629 ft. Fire behavior is described as “creeping” with up to 3-inch flame lengths. The 588 Fire is currently estimated at 3 acres. The next update will be provided around 9 pm tomorrow (6/4/16). ALAMOGORDO, RUIDOSO, NM, June 2, 2016 – For Immediate Release – Fire officials on the Lincoln National Forest have made the decision to manage the 588 Fire for multiple objectives. This lightning-caused fire was discovered on the evening of May 31 and is located about 4 miles south of Glencoe, NM. Wildfires that are ignited naturally (by lightning) may be candidates for this type of management, given the ignition occurs in the right place at the right time. Over the past two days, the fire behavior on the 588 Fire has been described as “creeping” through grass with small flames (up to 3-inches), resulting in growth to 3 acres, as of today. The over-story is predominantly piñon juniper with some occasional ponderosa pine trees. Management of the 588 Fire for multiple objectives can benefit the health of the forest by reducing hazardous fuel accumulations, improving wildlife habitat and restoring overall forest health. An added benefit includes improvement to cattle grazing allotments, as well. While the fire will be able to move naturally within a predesignated area, its intensity can change as weather and fuel conditions change. Hotter, drier weather will result in increased fire behavior, while cooler, possibly wetter weather will minimize the fire behavior. Fire intensity is expected to increase as it consumes larger-sized vegetation, such as piñon juniper trees, downed logs and branches. “The timing for managing a fire for multiple objectives is appropriate now because we’re close to the probable end of the fire season, which is when the monsoons set up in early July, and, although we are in fire season, the pulses of cooler weather and scattered rain showers contribute to moderated fire behavior,” said Ryan Whiteaker, Forest Fire Management Officer. “It is a narrow window or timeframe during which time we can implement a strategy to manage for multiple objectives. This fire may have a lifespan of 4-6 weeks, burning at different intensities as it moves across the landscape,” Whiteaker added. This fire is staffed with approximately 30 personnel from the Forest Service. In this case, the role of the firefighter is to monitor, check and direct the spread or movement of the fire. In some instances, firefighters will protect improvements such as fences, PVC water pipelines on grazing allotments, and other structures or infrastructure that are present in the general area or vicinity of the fire. Protection of these improvements is often attained by using fire to conduct low intensity “burn out” operations creating a protective barrier between the improvement and the active fire.